Our team has recently returned from Panama where they installed the first two, of six, Solardome® geodesic domes (6.11m SOLARDOME Capellas) at the Smithsonian Tropical Research Institute. Dedicated to understanding biological diversity, the Institute is one of the world’s leading research institutions. They provide a unique opportunity for long-term ecological studies in the tropics, and are used extensively by some 900 visiting scientists from academic and research institutions in the United States and around the world every year. Having only been here for six months, I am intrigued by this project – how and why are our geodesic domes so good for ecology and environmental research? And what has this enabled researchers to do and achieve? I took the opportunity to ask a few questions of Bruce Cowan, founder and Chairman of Solardome Industries, and someone who knows almost all there is to know about glass geodesic domes. MARTIN: There are several research establishments that are using Solardome® geodesic domes. Which institutes have you worked with? BRUCE: Our domes have been particularly popular with universities and can be found at Lancaster, Bangor, Edinburgh, and Montpellier in France to name a few. Our domes are most frequently found in the Environment departments and their projects usually involve several domes for long-term research. For example, Lancaster University initially had 22 domes. 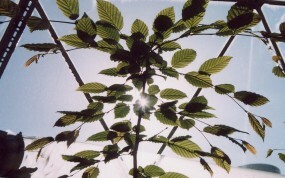 In addition to universities, Maff, which is now Defra (Department for Environment, Food and Rural Affairs), had four Solardome® glasshouses. We helped dismantle them from their old research station in Berkshire and fully refurbish and re-erect them on a site in Yorkshire. In more recent years, our domes have been used for ecology research at Wellacre Academy, Bournemouth University, McGill University in Canada, and this year, the Smithsonian Tropical Research Institute in Panama. MARTIN: What type of research is being carried out within the domes? BRUCE: Our domes are used for a wide range of ecology and environmental research studies; from large-scale, long-term experiments resulting in published research papers, to smaller scale research aimed at supporting student learning. 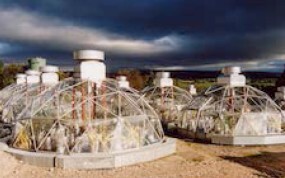 The 22 geodesic glasshouses at the Air Pollution and Climate Change Unit (APCCU) at Lancaster University have been pivotal to the success and validity of their environmental research over two decades. 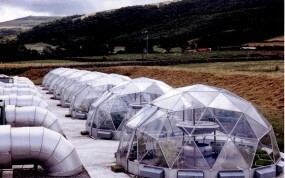 The domes provided stable identical environments to investigate the effects of various air pollutants on plant health, and more recently the effects of rising atmospheric CO2 concentrations on plant growth and soil carbon storage. The Centre for Ecology and Hydrology at Bangor University has been adding Solardome® glasshouses to support the demands of their research facilities since the late 80’s. Today, using 8 domes, the research of Dr Gina Mills at the Air Pollution Facility involves experimental studies of the impacts of ozone on vegetation. These studies utilise the controlled and closely monitored environments created in their glasshouses. Defra’s four domes were specifically selected to enable research to be carried out on populations of parasitic wasps and other flying insects. We even designed special entrances to prevent them escaping. 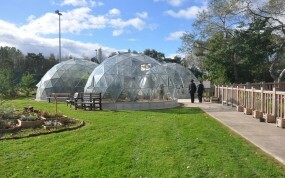 At Wellacre Academy, each of their three domes hosts a different growing environment. The biomes support learning about plant nutrition, growth and breeding and help to teach the importance of a sustainable environment in our society. A new 6m diameter Solardome® glasshouse at Bournemouth University, named the ‘BioDome’ is being used to house a collection of carnivorous plants. Their research focuses on the effect that contaminated insects have on the growth of carnivorous plants. MARTIN: Why are Solardome® geodesic domes so good for research? BRUCE: It’s the geodesic shape that makes them ideal; they are extremely strong, robust and durable. Over the decades they have proved they can weather the harsh conditions of their locations. At Lancaster University, they are located on an exposed hillside that regularly receives heavy buffeting from the wind and rain. Again, at Bangor, the site is highly exposed, so that is why the university opted for Solardome® glasshouses as the best structure to withstand these extreme conditions, as well as providing optimal conditions for plant growth. They have now been using domes for over 25 years. In addition to the strength of the geodesic structure, their unique glass design also provides maximum light transmission and solar gain with two panes of glass at right angles to the sun’s rays at all times. With better ventilation, airflow and air distribution than traditional glasshouses they create the ultimate growing environment. Dr James Heath, Research Associate from Lancaster University, explains this further in the Lancaster University case study. When Montpellier University in France asked us for a Solardome® glasshouse, they wanted to find a structure that left no shadow on the plants from the sun. Although impossible, our glasshouses came in very close with the elegant and minimalistic frame only casting a minor shadow. Again, our domes proved the only practical building solution for their use. During the early days, I also remember having a conversation with the Professor of Plant Physiology from the University of Edinburgh. He told me about the ‘edge effect’, that occurs when growing under glass – it’s when plants nearer the glass bend towards the light. If even growth is desired, a conventional glasshouse shouldn’t be used as plants will be affected by the uneven distribution of natural light. This problem is greatly reduced in a hemispherical glass dome, such as ours. What my conversation with Bruce confirms is that our domes provide an ideal facility to aid ecology and environmental research. Our domes offer a structure that can be adapted to meet research needs: from simple, small experiments to learn about plant physiology and biodiversity to the creation of climate and growth chambers for long term, large scale experiments. Our domes have a proven track record in their ability to aid ecology and environmental research. This history of success along with the publication of research papers, feedback from institutions and requests for new installations provides proof that the Solardome® glasshouse really is an exceptional structure perfect for long-term research projects. If you have any questions about how our domes can enhance your research capabilities, however large or small, contact me on 0845 450 2155 or martin@solardome.co.uk.